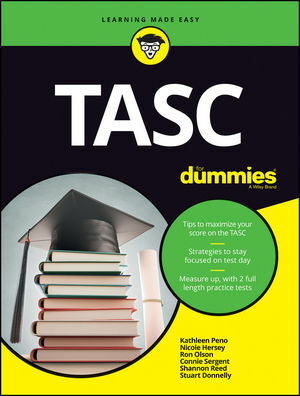 If you encounter a scatter plot on the TASC Math exam, you’ll probably be asked to show how the two variables in the chart are related to each other—or whether a relationship exists between them at all. A scatter plot shows the relationship between two variables. When looking at a scatter plot, you look at the correlation, which gauges the strength of the relationship and the direction. This means a correlation can be strong or weak and can be positive, negative, or neither. Depending on the strength of the correlation, you can infer a trend in the relationship. The figure shown here illustrates some examples of scatter plots and the types of correlations that can appear. Notice how when there is a correlation, the points tend to line up in one direction. A common example of a scatter plot is the relationship between people’s shoe sizes and their IQs. When a large data collection is analyzed, you see that there’s no correlation. If there were one, you could make a statement like “People with bigger shoe sizes are smarter.” However, there’s a wide range of IQs and shoe size combinations, and you can’t gauge a person’s intelligence based on his or her shoe size (no correlation). What statement corresponds to the relationship illustrated by the following scatter plot? A. The longer you study, the worse you will do on the test. B. The longer you study, the better you will do on the test. C. The amount of time studying does not affect the score on the test. D. Not enough information can be gathered.